Got an email this week about a new book coming out from Bittersweet Editions. In releasing what looks to be their fist graphic novel they are really pushing into the world of comic for the sake of artistry. 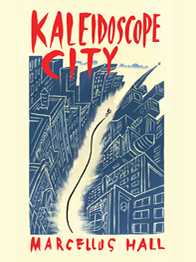 Their press release bills Kaleidoscope City as, “…a spellbinding book, a remarkable graphic novel debut by an accomplished illustrator and acclaimed musician discovering a new creative medium. With Kaleidoscope City, Marcellus Hall has created a meditation on romance and our collective need for connection. The book provides snapshots from a year in the life of an artist struggling to rebound from a failed romance. As the seasons change, the unnamed man searches the five boroughs for inspiration. Buoyed by his curiosity and a search for meaning, with sketchbook in hand, he finds inspiration in unexpected places, from far-flung neighborhoods to fleeting glimpses of a mysterious woman. With its beautiful line work and sparse, emotive prose, the book is an ode to creativity, a love letter to New York City and a celebration of urban life. The Book is already getting good reviews, and I for one am always interested in the cross roads of art, words, and music. 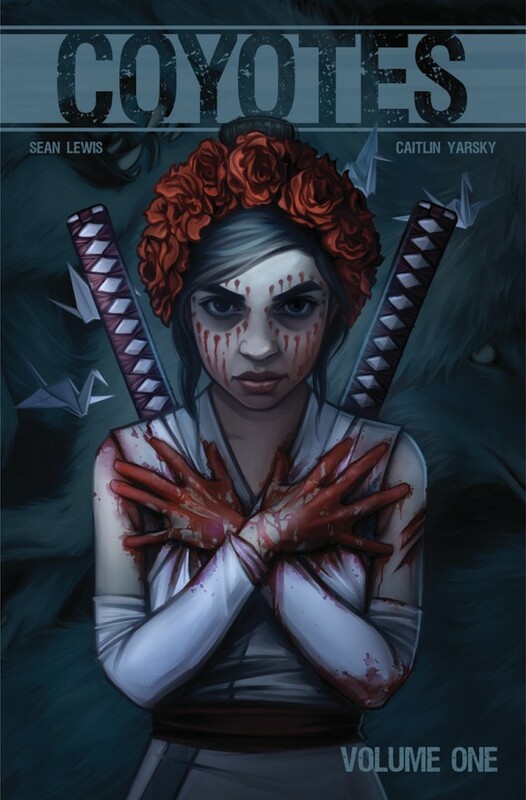 “Writer Sean Lewis (THE FEW, SAINTS) and artist Caitlin Yarsky will collect the first four issues of their dark fantasy series COYOTES this April. In a dusty desert town on the southern border of the United States, women are going missing. Detective Frank Coffey is called in to investigate—and finds Red, a 13-year-old girl with a sword and a mission: to murder the werewolves stalking the border and picking women off one by one. It’s Kill Bill meets The Howling in the cutthroat world of COYOTES, where nothing is ever as it seems. COYOTES, VOL. 1 (ISBN: 978-1-5343-0647-9, Diamond code: JAN180663) hits comic book shops Wednesday, April 11th and bookstores Tuesday, April 17th.” This is one that you need to tell Jon about so you can pick your copy up at Hall of Justice Comics and Collectibles. I am a sucker for pretty much anything that feels like a doom metal album come to life and the plot summation of Euthanauts is exactly that. 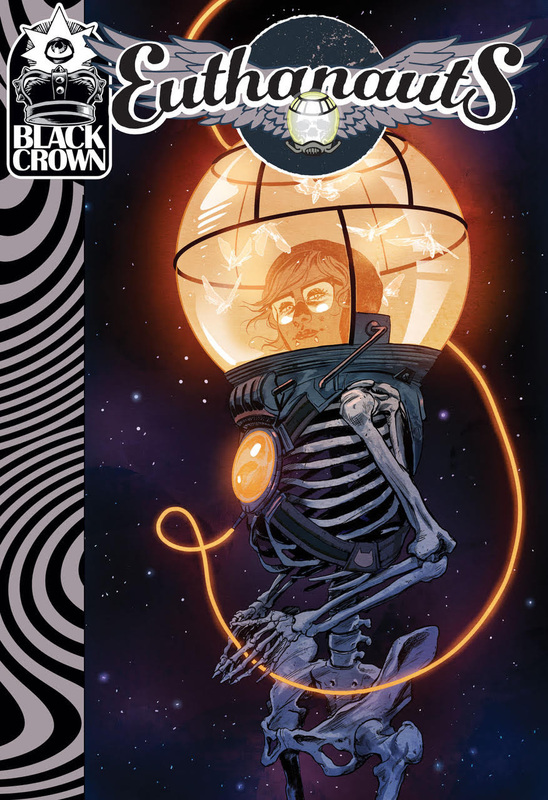 In their press release Black Crown says: “…diving into the great beyond with EUTHANAUTS, her (Tini Howard) second Black Crown title. She’ll be joined by artist Nick Robles (Alien Bounty Hunter) to answer the ultimate question: What happens to us after we die? Two women aim to find out in this series which combines classically intrepid explorers with our anxieties about death and the beyond — with psychonautic mindspaces to match. The first arc will kick off this July. Through Black Crown IDW can take some chances on things that would have been on a label like Vertigo, or Image, and that is a good place for any comic company to be. Bring on the creativity IDW! talk to fans and sign books! From Image this week, two new series launch. into a myth we can rally behind. rogue aliens back to the Port of Earth.